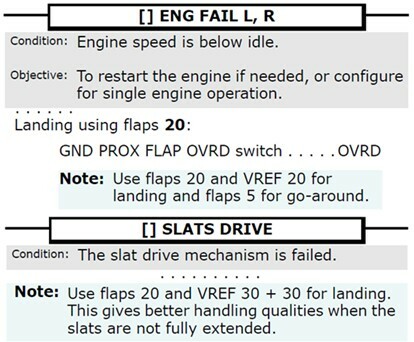 The recent phase training combined Engine Failure with Flaps/Slats Drive/Control failures introduced the issue of entering a reference speed when to different checklist are specifying two different Vref settings. Another item for the P&T. When dealing with multiple NNM’s, crew may be confronted by conflicting requirements with respect to selecting a landing flap and a Vref speed. A specific example would be an Engine Failure combined with a Slats Drive malfunction. 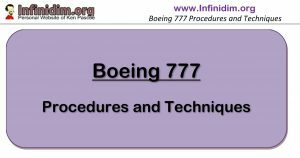 In all circumstances crew can nut out the correct Approach Flap / Vref Speed / Go Around Flap setting and estimate a landing distance appropriately through common sense and an understanding of the requirements driving Approach Flap, Approach Speed and Missed Approach Flap requirements. In this example, Flaps 20 will be the landing flap. The conflict in Vref is settled by choosing the most conservative (highest) Vref speed (Vref 30+30). Since Vref 30+30 is greater than Vref 20, Flaps 5 to improve climb performance in the missed approach is available – and preferred.